As halloween is approaching quickly, I believe some of you are thinking of throwing a boo-bash Halloween party but don’t know where to begin with. Fret not. The most important step in throwing a party is to ensure that all your ghost friends are well-fed. Let’s agree that food is extremely important. And now you must be thinking that with your limited cooking skill, how are you going to prepare all that to your guests? 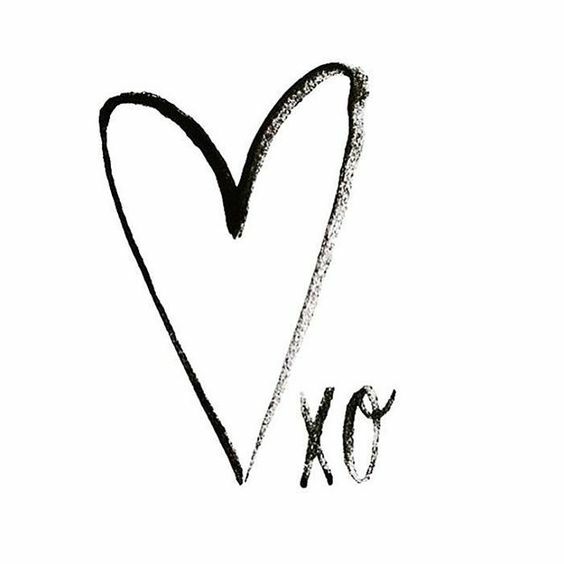 FRET NOT CUZ I’VE GOT YOU COVERED. Here are a list of easy peasy but spooky as hell halloween snacks that you can try on your own. 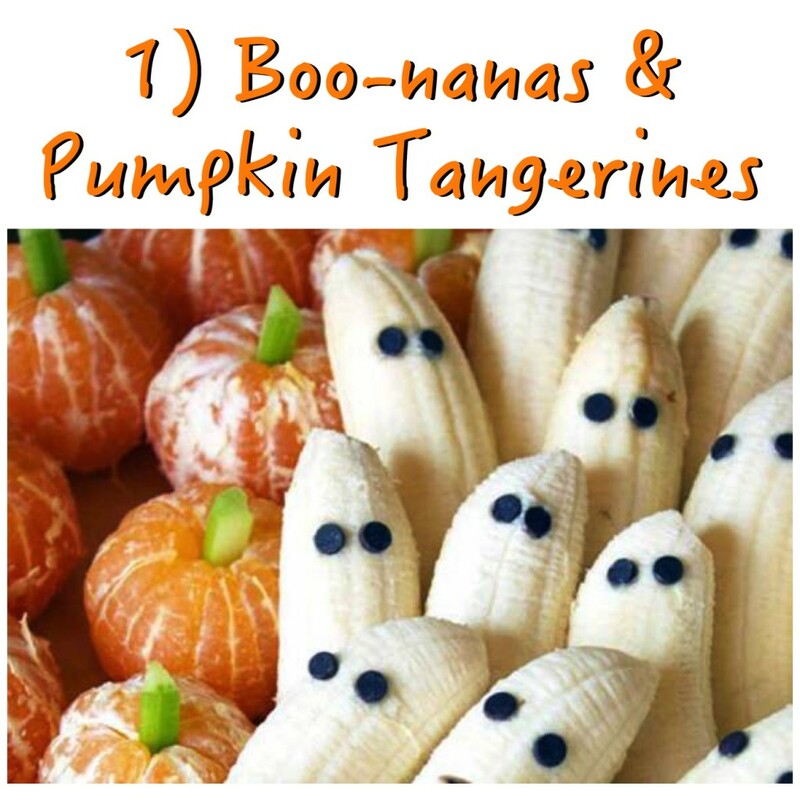 Turn your bananas into Boo-nanas and tangerines into pumpkins! 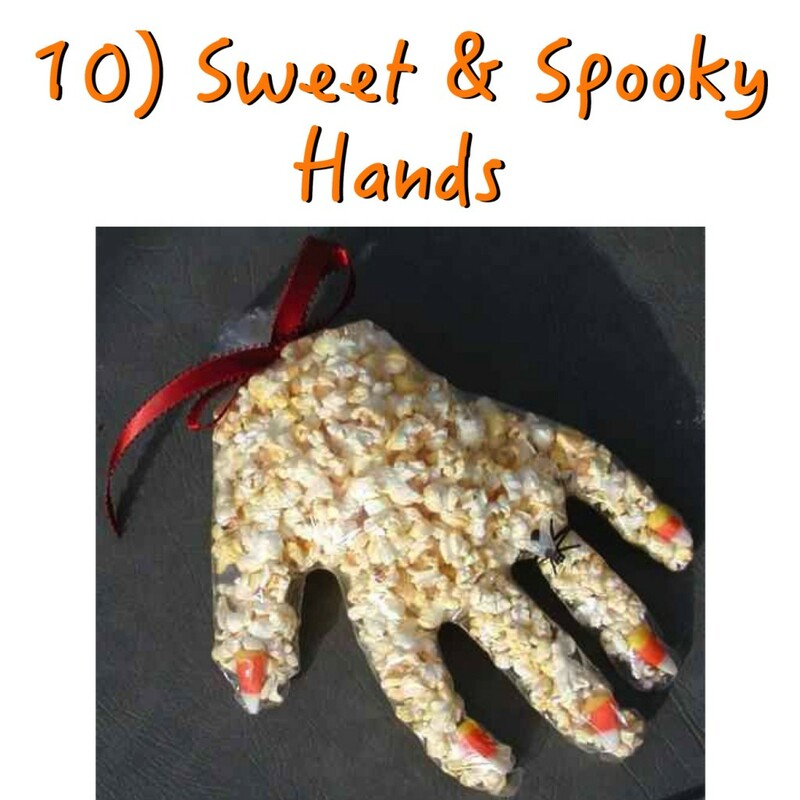 This halloween treat is so easy to make it takes only 10 minutes to prepare! Peel off all the tangerines. Cut celery into small sticks. Now, stick celery into top centre of tangerines. For the boo-nanas, firstly you need to peel off all the bananas. Then, cut bananas into half. Lastly, stick chocolate chips into bananas to make the ghost eyes. There you’ve got yourself a lil’ spooky halloween treats! Have you ever seen such spooky strawberries? 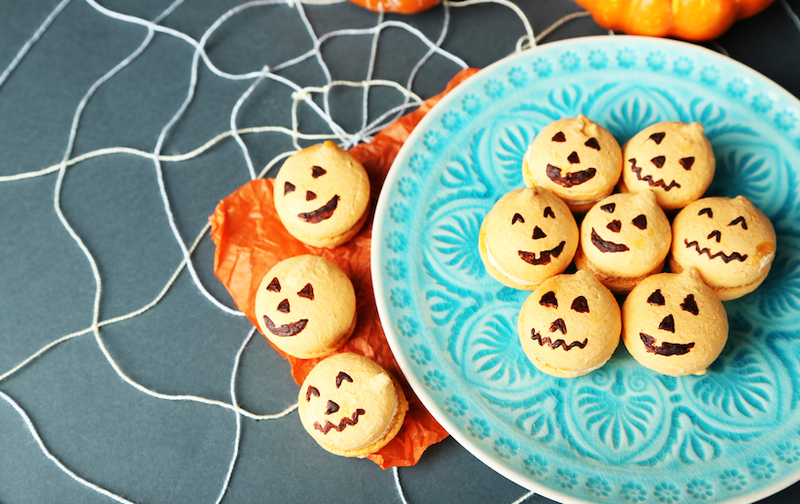 With just three ingredients, this can be a great halloween treat idea to serve on the table! Prepare a microwave-safe bowl. Pour in a handful of white chocolate, then, put it into a microwave for 30 seconds. After 30 seconds, take out the bowl and stir the white chocolate until it completely melted and there’s no visible lumps. Prepare a tray with baking sheet on top. Dip the strawberry into the melted white chocolate until it covers most of the surface, leaving some space on top of the strawberry. Place the dipped white chocolate strawberry on the tray. Now, before the white chocolate hardens, stick two chocolate chips into the strawberry for eyes. Once you’ve done adding eyes to the strawberries, put them into the freezer to let the white chocolate coat harden. Now it’s time to melt the chocolate chips for mouth! Prepare a microwave-safe bowl, pour in a handful of chocolate chips and put into a microwave for 30 seconds. After 30 seconds, take the bowl out and stir the melted chocolate chips until there’s no further visible lumps. Pour the melted chocolate chips into the piping bag. Take out strawberries from the freezer. Make one big round mouth on the white chocolate coated strawberries. That’s it! 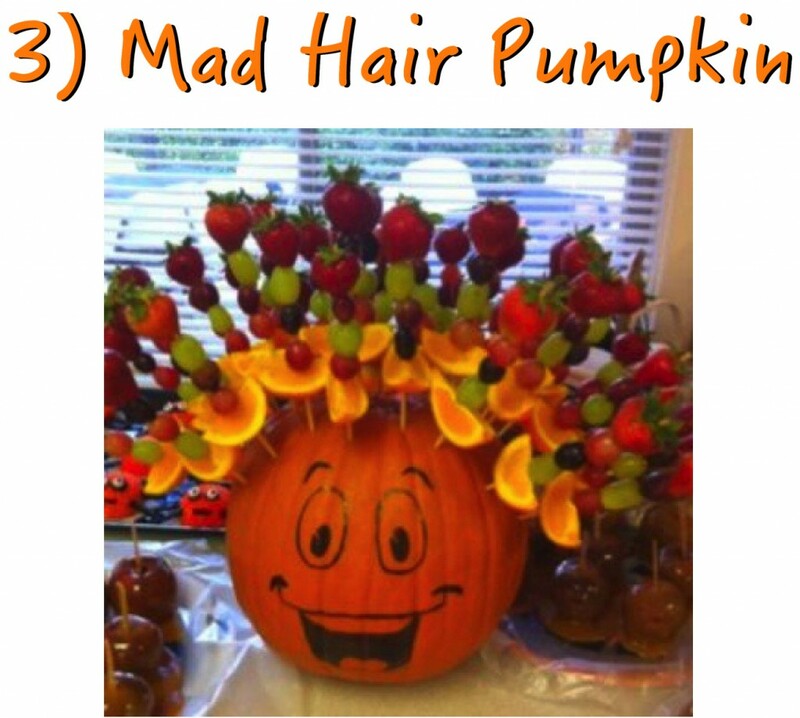 Funky pumpkin with mad hair display! Oh wait, it’s actually fruit skewers, yummmms. 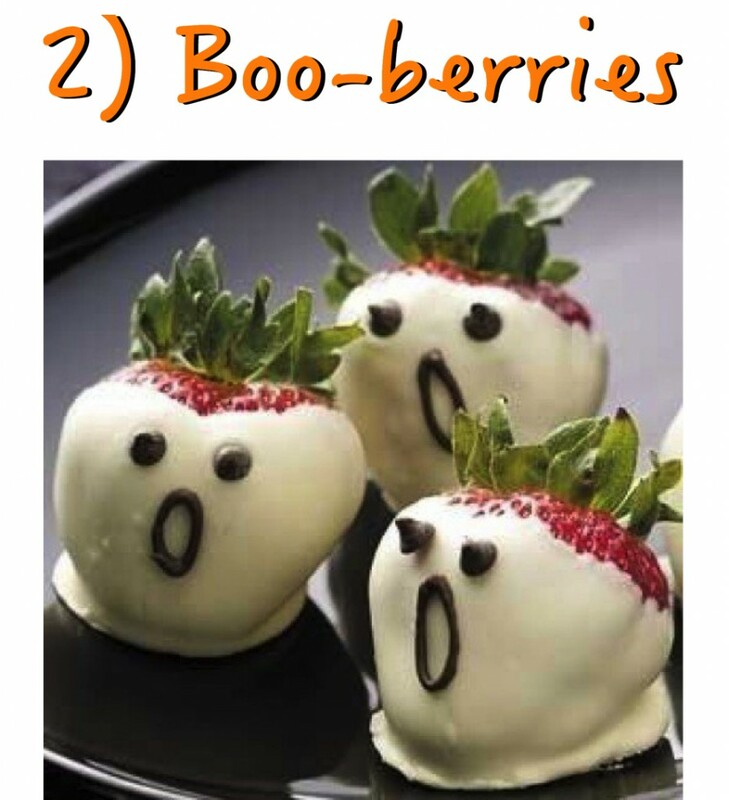 Try this halloween treat idea at your halloween party because it’s so simple to make! Prepare one carved pumpkin for display. If you feel that carving a pumpkin is very tedious, try using a sharpie pen to draw scary face on the pumpkin. Now it’s time to make fruit satays (a.k.a pumpkin’s hair!). Cut all fruits into small pieces, then, slide the fruit pieces onto the wooden skewer. Once you’ve done making fruit satays, stick all fruit satays in pumpkin and that’s it! Pretty easy and healthy halloween snacks! 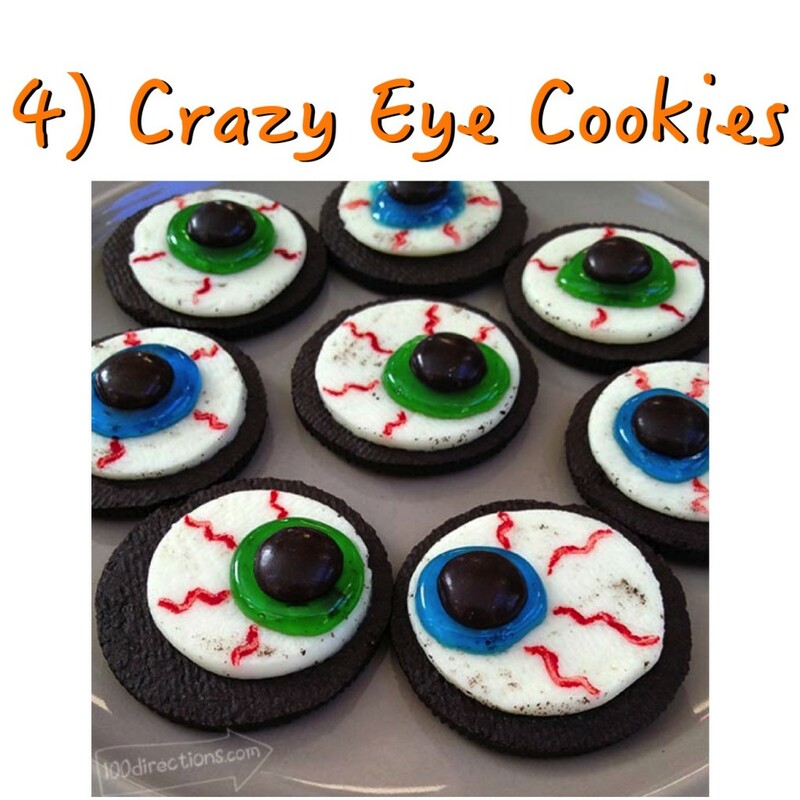 Crazy eyeballs cookies made with Oreo? 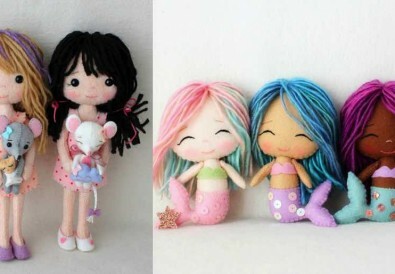 SO CUTE & YUMMY. Twist and remove one chocolate cookies from the Oreo. Now you’ve got a piece of chocolate cookies with frosting on top. Squeeze a fair amount of blue or green decorating gel on top of the frosting. Stick one M&M’s chocolate on top of the decorating gel. Now it’s time to add red veins on the eyeballs! Use your small paintbrush and dab on the red food coloring, carefully paint some curvy lines on top of the Oreo frosting. That’s pretty much it! Time to replenish some protein! 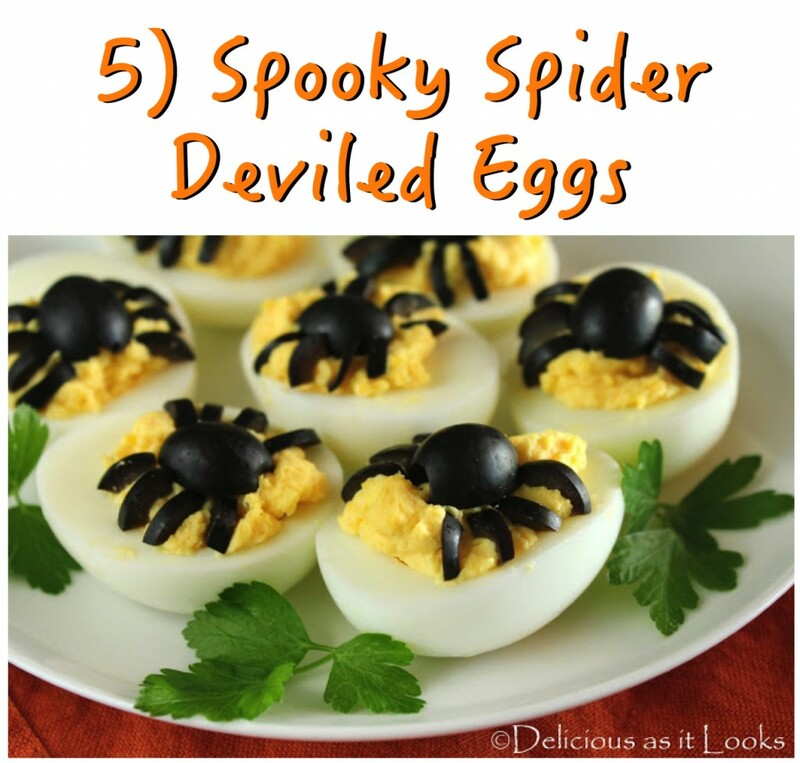 Definitely a healthy halloween snack that has lots of protein and scary effect! Cut hard-boiled eggs into half. Separate out all the egg yolks into a bowl, leave the egg whites on the plate. Once you’ve done mashing, scoop out a spoonful of mashed yolk and add into the eggs. Cut black olive into half, and put it on the mashed yolk for the spider body. Thinly sliced another half of the black olive into 8 for the spider legs. Put four on each side. You’re done! 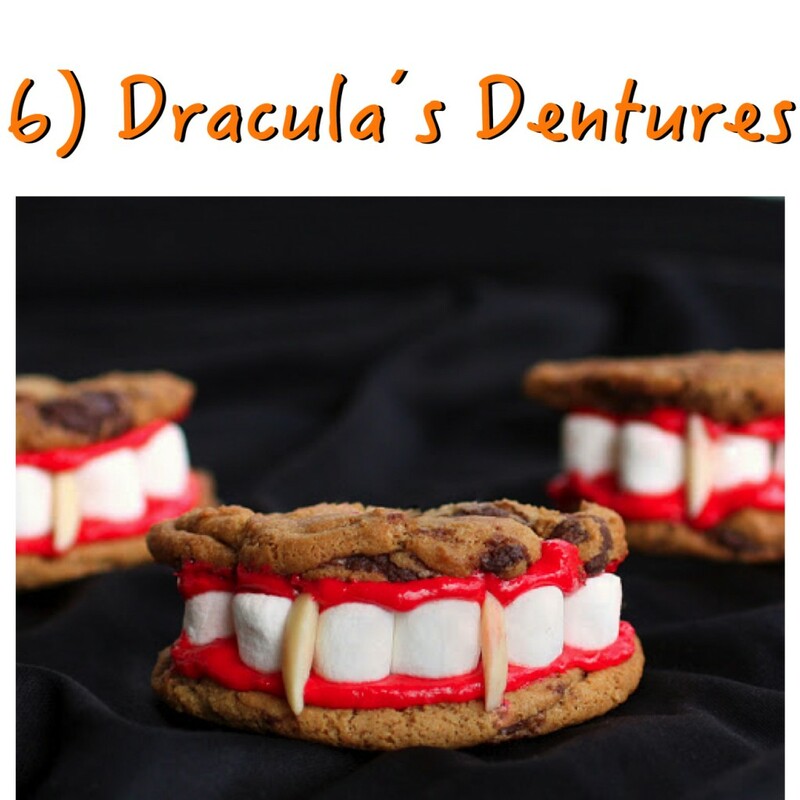 Dracula’s dentures that are made out of marshmallow, cookies and some sugar icing! Cut chocolate chip cookies into half. Be careful when you’re cutting as it will break easily. Spread red vanilla frosting on the bottom of the cookie. Then, place 6 marshmallows around the curved edge for Dracula’s teeth. Stick in two almond slivers in between teeth for fangs. Voila! There you go, a scary dracula’s denture which is so delicious to eat! If you’re a huge fan of chocolate, then you might wanna try this halloween snack! The witch hats look so legit BTW! Place fudge-striped shortbread cookies on a plate. Make sure the chocolate bottom of each cookie is facing upward. Now, squeeze the orange icing at the centre of the cookie. Stick one Hershey’s Kisses Milk chocolate on top of the orange icing. 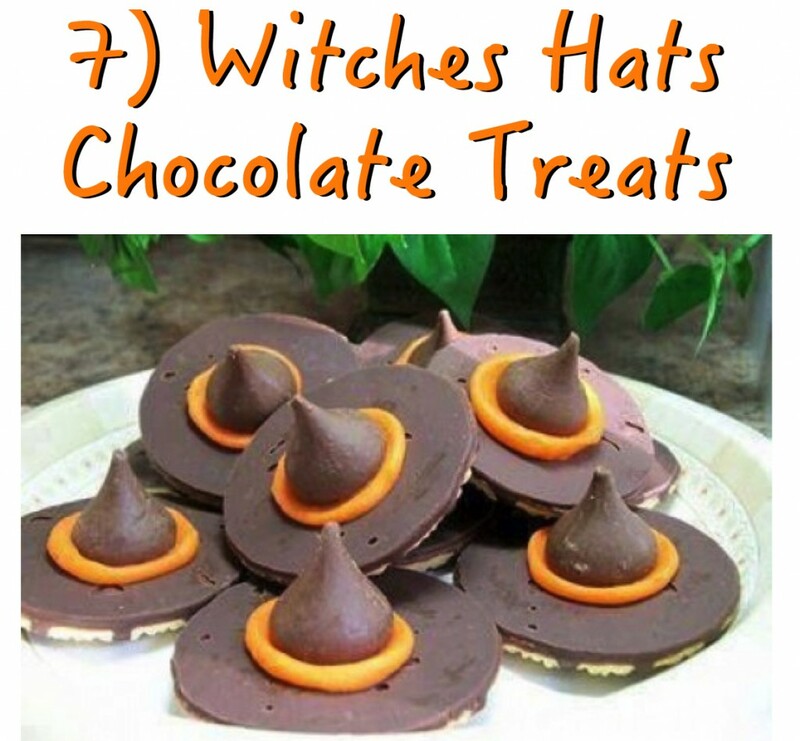 Here you go, a witch hat cookie which is so rich in chocolate! Too much pumpkins for Halloween? Said nobody ever! First, cut green M&M’s chocolates into half and set them aside. Then, prepare a baking tray with waxed paper on top. Prepare a microwave-safe bowl, pour in 12 oz of orange candy coating and microwave for 30 seconds intervals. Take the bowl out after every 30 seconds and stir them well, until there are no visible lumps. Dip the whole pretzel twist into the melted orange coating, until it covers the pretzels completely. Then, use a fork to pull the pretzel out and place it on the baking sheet. 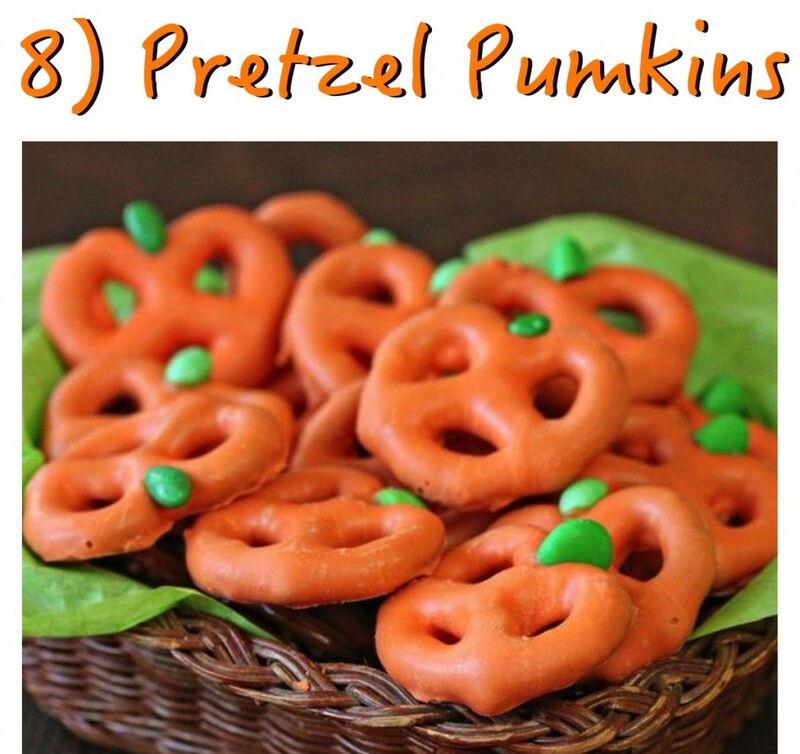 Stick the halved green M&M’s chocolate into the top of the pretzel for pumpkin stem. Once you’ve done making all the pretzel pumpkins, keep it in the refrigerator to set the coating. 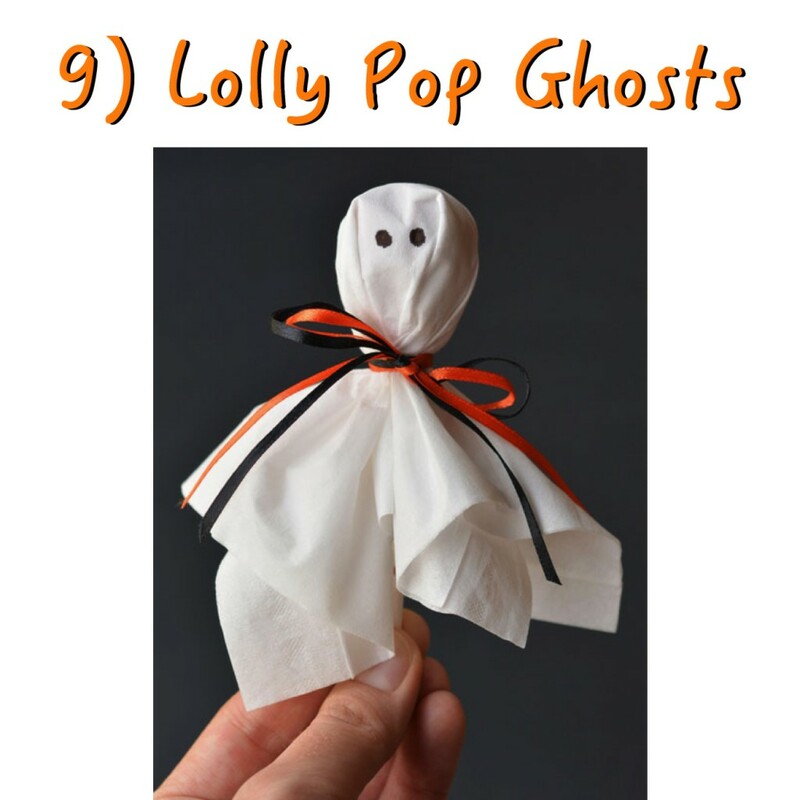 This ghost lollipop is soooo cute and it’s so easy to make! You can make extra and give it to your friends as a Halloween gift! Prepare two sizes of tissue paper: One is full sized tissue, another one is quarter piece of tissue to create double layers of tissue. Double layers of tissue will ensure the lollipop color doesn’t pop underneath the tissue. Now, lay out full sized tissue on table. Place a quarter piece of tissue in the centre of the full sized tissue. Place a lollipop in the middle, then, wrap the tissue over the lollipop and stretch the elastic over it to secure it in place. Time to add eyes on the lollipop ghost! Remember to gently press sharpie onto the tissue so that the ink doesn’t smudge all over. Start with small dots until each eyes are equally big. Lastly, wrap tiny orange and black ribbon around the neck. That’s it! A spooky ghost lollipop which is super cute and easy to make! It’s popcorn time! All you need is a hand gloves, some popcorn and candy corn, and a ribbon. That’s it! Add one candy corn into the tip of each finger of the hand gloves. Now, fill up the hand gloves with pop corn. Tie it off with a tiny elastic, then, wrap ribbon around the hand glove. Cut out a small piece of double sided tape, and stick onto the fake spider. Attach the fake spider onto the ring finger of the glove. That’s all for today’s Halloween topic! I hope you guys find today’s topic interesting and informative. Out of these 10 halloween snacks, which one is your favorite? 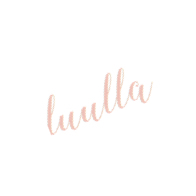 Stay tuned for more awesome blog topics. We update on every Monday, Wednesday, Friday and Saturday.